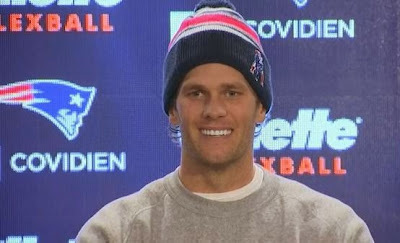 MyBriefs.com: Sports Briefs: Lie from New England, it's Tom Brady! Sports Briefs: Lie from New England, it's Tom Brady! Chris: "I admit it, I cheated. I deflated the footballs. I've been throwing under-inflated footballs for years. It's just what I prefer. When I played football as youth, my friends would bring over air pumps, hoping to inflate the ball when I wasn't looking. I don't even blame the Patriots' equipment managers. It’s really all me. I have a little known skin condition, a result of my family breeding with a porcupine many generations ago, which causes my skin to sometimes become quill-like, capable of actually puncturing the ball. So my suspension is justified. I'll accept it like a rodent . . . I mean a man . . . " Not only would an admission of guilt like this from Tom Brady be widely applauded, it would cause geneticists to immediately take interest in the NFL. Joe: I do not know what the right answer is to the question regarding whether the Patriots punishment is too harsh or too lenient, but I do believe the NFL had to send a strong message and it did. Patriots were hit on all fronts, suspension, cash, and future draft picks. Brad: I think the punishment for Tom Brady is a fitting one. Regardless of how involved he was, he knew it was going on and let it happen. He tampered with the game and the integrity of it, so I do think this punishment is a perfect one. It punishes Tom Brady by suspending him for four weeks, and it punishes the Patriots, causing them to be more strict with what is happening in their program and not allowing situations like Deflategate and Spygate to happen. Ralphie: I'm glad he got some form of punishment, but I think it was too lenient. They should have had their championship taken away. Chris: Fall and spring semesters in college last four months. Numerous reports and research papers are written by scholars each semester. Conversely, the Wells Report itself took almost four months to complete. This makes me wonder how Ted Wells managed to get through college, assuming he did not have Droopy Dog as his English professor. The next report Roger Goodell needs written, he should ask a college intern to do it and give them a deadline of a week. Brad: It probably took so long for the Wells Report to come out because they had to gather the text messages, talk with Tom Brady, and both of the ball boys. There was a lot of information that they had to gather to make sure the report was as accurate as possible, but it is almost impossible to be 100 percent sure of what has happened until Brady confesses. Joe: The Wells Report release was timed to reduce impact to the ongoing NFL activities, such as the Super Bowl and the draft. The May release allows for all summer to work through the appeal process and revise procedures for game-ball pressure control. Ralphie: I think they were hoping to reach different conclusions and were trying to try every option before admitting that the Patriots cheated. Chris: Had Brady got caught breaking the rules in an office job, he would have been fired. Had Brady got caught cheating in college, he would have been expelled. Had Brady got caught cheating at poker, he would be on the run from the mafia and would be answering to a pseudonym. Had Brady got caught cheating in a relationship, he would have broken up with Bridget Moynahan and married Gisele Bundchen. Brad: I think Tom Brady played a huge role in this scandal. I mean, he is regarded as one of the best quarterbacks in NFL history. Why would a ball boy deflate the balls without him asking? Deflating the ball makes a huge difference in the quarterback’s game. Why would they jeopardize his game by doing that? He had to have played a significant role in this. Ralphie: I don't think he declared them, but I'm sure he knew it was happening and chose not to tell the truth. Chris: I'm surprised that Bill Belichick did not attempt (or at least was not successful) at feeding the footballs in question through a paper shredder. Coincidentally, the Patriots did recently put in a purchase order for an industrial-size meat grinder. Joe: I do believe Brady was aware of the deflated or lower-pressure balls. I believe he provided feedback to the equipment personnel regarding the feel he desired. That feel just happened to result in a game-used ball pressure lower than league rules. Chris: What would have happened if Ted Wells had pulled a few all-nighters and finished his report before the Super Bowl? Would Jimmy Garappolo have gone to Disney World? Rather than saying the Patriots would accept the findings of the report, followed by announcing their intentions of using all 243 pages of the report as toilet paper, Robert Kraft should be writing Wells a thank you note, expressing appreciation for a cornucopia of rough drafts, which prevented Brady from missing the Super Bowl and instead will cause him sit out games against the Bills and Jaguars. Brad: I think the best thing Tom Brady could do at this point is apologize. He needs to apologize to everyone; trying to fight this suspension would only cause people to think less of him and his game. Joe: I believe Brady should not appeal this ruling. I believe he knows there were violations, and he failed to cooperate with the investigation. Yes, the appropriate action would be to apologize and move on. That action would probably not be supported by the players union. Ralphie: I think he should accept it and apologize. As the quarterback, he is the team's leader, and he has to step up and set a good example. I agree that the punishment seems lenient, especially since the Patriots won the championship while Ted Wells was typing the report using an actual typewriter on paper that he made by hand. Also, Tom Brady is a mimbo, and it's about time he takes a break from admiring his reflection for 5 minutes to step up and be the team leader he is supposed to be. The two times he needed the cheat the most and he didn't. Against my New York Giants. I could care less about deflating footballs. Honestly, I don't think it had any relevance to the buttwhooping the Colts got. They would've lost the game regardless in my opinion. I do wish Tom would just man up about it though.